Talipot palm is a kind of evergreen arbor. It originates from tropical Asia and usually can grow as tall as 20 meters. It is tall, mighty, upright and round in shape. The top of the tree is like a huge umbrella, and its leaves spread apart like the palm of a man. It gives people the impression of sobriety and vitality, and is a superb plant for forestation in tropical areas. But do you know talipot palm is also a carrier of the Southeast Asian cultures? A long time ago, the people of Southeast Asia begun to use the huge leaves of the talipot palm to record their characters; therefore, the culture of the Southeast Asian countries also enjoys the title of �culture on green leaves�. The famous �palm leave Buddhist scriptures� were also written on the leaves of the talipot palm. 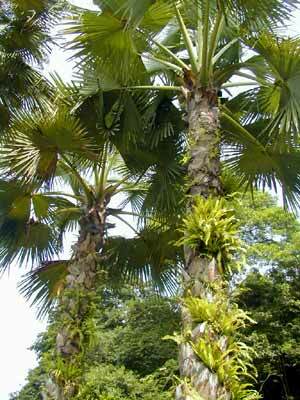 Some people believe that talipot palm is a kind of symbol of geological and national cultures. In tropical areas, wherever there is Buddhism, there must be talipot palms. The Dai folks of Xishuangbanna believe in Buddhism, and the talipot palms planted in temples there originate from India and SriLanka etc. According to the study, they were introduced into that area as Buddhism spread to Xishuangbanna; and they enjoy a planting history of over 700 years up to the present. The Dai folks of Xishuangbanna are just like the people in Southeast Asian countries, and they have begun to record their history on talipot palm leaves a very long time ago. After simple processing, cutting, modifying, planishing, and drying, they would bind the sword-shaped leaves into volumes; then, they would use their special iron pen to carve their characters on the �paper�. Then they would coat the characters with plant oil and clear handwritings would appear before their eyes. Palm leaves are endurable, and repeated use cannot make them fade in color; on the contrary, such repeated uses can even make the characters clearer. The Buddhism scriptures on palm leaves, which have been kept for hundreds of years, are still clear and recognizable today. The Dai folks have a long-standing history and brilliant civilizations. As a carrier of such cultures, the palm leaves make it possible for the Dai folks to record and pass down their cultures. It is said that the Dai folks have as many as 84000 volumes of Buddhist scriptures on their talipot palm �paper�, the contents of whom include classical works of Buddhism, medical theories, literature and arts etc. In China, the Dai medicine, together with Chinese traditional medicine, Tibetan medicine and Mongolian medicine, is called one of the four traditional medicines. Since the theory, the history, and the clinical experiences of the Dai medicinal works were all carved on palm leaves, we still have the opportunity to arrange them and to study them today. Now, the local government has established a Dai Medicine Research Institute and a Dai hospital in Xishuangbanna. The literary works of the Dai people are also quite abundant, which rank number one in all 55 ethical minorities in China. Long poems with more than 1000 lines are totally over 500 pieces, such as �Ba Ta Ma Ga Peng Shang Luo (creation)�, �Gourd Letter�, �Song Pa Min and Ga Xi Na�, and the �Peacock Princess� etc. If they were not written on palm leaves, these beautiful and moving poems would have been lost in the river of history, and the people today could never appreciate them again. Since talipot palm has important values in the spread of cultures, the Dai folks of Xishuangbanna regard it as the symbol of their cultural development and are quite pride of it. The Dai folks even apotheosize talipot palms, and they believe only ardent Buddha could plant such trees alive. However, the scientists have solved this riddle. Whether or not a talipot palm tree can be transplanted successfully mainly depends on the sprouting and planting skills. Talipot palm tree is not only a superb plant for environmental forestation; it is also a great miracle. It blooms once after 40 years, and blooms only one time in its whole life; then, it will produce fruits and die away after the fruits are ripe. This kind of plant is called �monocarpic plant�. There is still a story about talipot palm leaves in Xishuangbanna today: in ancient times, the ancestors of the Han Chinese, the Dai people and the Hani people went on a pilgrim to ask for Buddhism scriptures. On their way back home, they encountered a big river, and the boat they sat on was turned over in the river. After the three ancestors got ashore, they opened their bags to dry the scriptures. The scriptures of the Han Chinese were written on paper; after drying, the characters on the paper resembled chicken�s footprints; therefore, the present Chinese characters look like chicken footprints. The scriptures of the Hani people were written on the hide of a buffalo. After drying, the Hani ancestor steamed the hide and cooked it into food; therefore, the Hani people have no characters now. The ancestor of the Dai folks was quite clever, and he carved the scriptures on the palm leaves. After drying, the characters were still very clear; therefore, the characters of the Dai folks are preserved as they were until today.